We here at team sport are completely hooked on this year’s Wimbledon and what a tournament it’s been so far! Undeterred by having no luck getting tickets by public ballot, I decided to head down after work one day and for a few pounds you gain entry to the grounds and to the outside courts. Nothing beats seeing the speed of those serves first-hand, and on most courts you are right next to the action! After play finished around 9 o’clock, we moved over to Henman Hill/Murray Mount to soak up the atmosphere by watching the rest of the Federer/Benneteau match on the big screen. All in all a great way to experience Wimbledon! Unexpected defeats of the French Open champs Rafael Nadal and Maria Sharapova completely opened up the championships and now, as all eyes are turned towards tomorrow’s semi-final matches, we are all asking ourselves – can Murray do it? Tsonga and Murray have met twice on grass; the first time in the Wimbledon quarter-finals in 2010 which went to Murray in four sets and last year in the final at Queen’s club, which Murray took in three sets. Overall, from their six meetings, Murray has won five. Both players are bound to be feeling the pressure as their nation’s hopes are placed upon them, and as neither player has made it to the Wimbledon final to date, you can guarantee it is going to be a spectacular match. Of course, we heartily wish both players luck – especially as the winner will face either Federer or Djokovic in the final on Sunday! 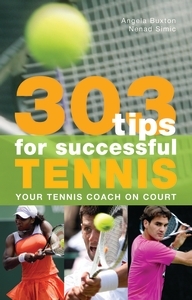 If you are thinking about picking up a racket yourself and giving tennis a go, visit http://www.lta.org.uk/Search/Find-A-Tennis-Court to find a court or club near you, or for some top tips and ideas to keep you focused during tennis matches, check out 303 Tips for Successful Tennis: Your Tennis Coach on Court by Angela Buxton and Nenad Simic. This entry was posted in Books, Sports News, Team Sport, Tennis and tagged Andy Murray, Bunny Austin, Tennis, Tsonga, Wimbledon. Bookmark the permalink.